Smart TV plays important part of Home Theatre. And DVD is an important component of movie source. Except DVD Player,does it has another way that allows you to play DVD on Smart TV? Maybe someone will say that DVD Player is necessary for watching DVDs on Smart TV. It should be impossible to play DVD on Smart TV without DVD player. Actually, we can make all this happen with the aid of a top DVD Ripper. Pavtube Video Converter Ultimate is such a magic tool to help you roll off your DVD protection and rip DVD to Smart TV supported formats like MP4 with perfect aspect ratio and best A/V quality. Especially, it has the TVS profile for the most popular Smart TV on the market, like Sony TV, Samsung TV, LG TV and Panasonic TV. With the optimized formats fot mian Smart TVs on the market, you needn’t worry about how to set the video parameters for better DVD playback on Smart TV. If you are a Mac user, please turn to Mac verison. How to play DVD movies on Smart TV? 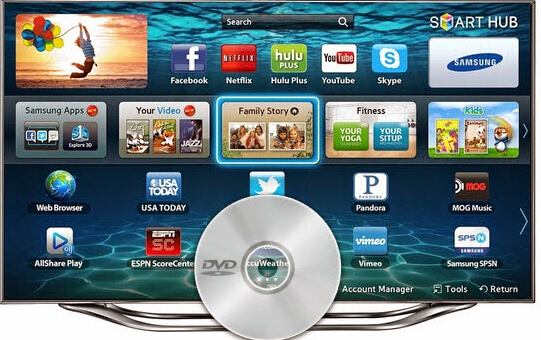 Install and launch the DVD to Smart TV Converter program. Click “Load File(s)” icon to load your DVD movies to the app. Set output video format under “Format” > “TVS”. The formats here have be equipped with the most suitable video/audio parameters according to the TV official website and user manual. You can choose the format according to your TV brand. 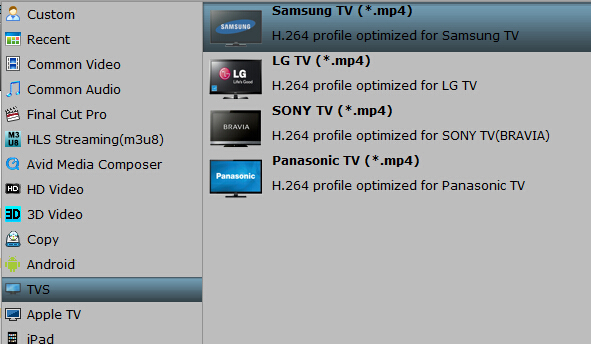 For example, you can choose “Samsung TV(*.mp4)” for your Samsung UHD TV. Of course, you also can simply choose “H.264 MP4” for your Smart TV. Click “Settings” to open the profile windows, in size box, you can reset the video size. If your UHD TV supports 1080p resolution, you can set the size to 1080p or you can simply preserve the original size. Plus, you can click “Edit” button to do some editing work cropping, trimming, settings effect, adding subtitles. Click “Start conversion” button and the program will rip DVD to Smart TV accepted video immediately. You can easily find the output files in the output folders once the conversion is done. That’s it. With this video processing, you are now able to play DVD video on your Smart TV smoothly. How to Copy DVD to NAS for Philips TV Playback?